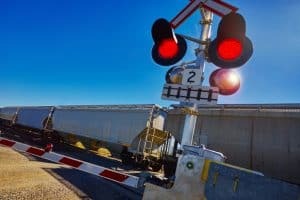 Cars Must Take Extra Care at Railroad Crossings | Merkel & Cocke, P.A. In early February, a car was struck by a train at a crossing in Clinton. The accident occurred near Parker Drive and Clinton Boulevard, and the car was struck by an eastbound train. The driver was injured. The area was closed until repairs could be made to the crossing arm, authorities could clear the scene, and the train could continue moving. Unfortunately, these types of train versus car accidents are all too common. According to the Federal Railroad Administration, 2,025 train-vehicle collisions with 265 fatalities occurred at railway crossings in 2016. Eight of these fatalities happened in Mississippi. One particular train crossing in Mississippi seems to be particularly susceptible to vehicle accidents. Since 1976, there have been 16 train-vehicle crashes at a Main Street intersection in Biloxi—most recently on March 17, 2017, when four people were killed when a train hit a charter bus stopped on the tracks. Forty other bus passengers were hurt, four with critical injuries. Another fatal collision occurred in the same location in 2003 and another in 1983. Also, in January 2017, a truck driver became stranded on the tracks and was able to get out of his vehicle before a freight train plowed into it, pushing it about 80 feet before coming to a stop. No one was injured in that particular incident. Some cities have discussed removing railroad crossings altogether and replacing them with tunnels or overpasses. Other cities use walls that pop out of the street or steel poles that rise out of the ground, so cars cannot maneuver around them when a train is approaching. However, the cost to implement these can run past $1 million. Operation Lifesaver stresses the importance of driver awareness at railway crossings as well. Railways use what’s called “active” and “passive” signs to warn traffic about train crossings. Passive signs are signs that visually alert motorists they are approaching a railway crossing. You might see a yellow sign with an “X”-type symbol it on or a white “X” painted on the road near a crossing. Active signs are the electronic, usually blinking, signs that warn motorists that a train is soon approaching. Some crossings only have flashing lights and bells, and others also have gates that go down when a train is approaching. It’s illegal to go around these gates unless a railroad employee or law enforcement officer flags you around. Many drivers don’t realize how long it takes for a train to stop—even if a train engineer sees you on the tracks, it can be too late. A train traveling 55mph can take a mile or more to come to a stop. Trains and cars are a deadly mix. The car accident attorneys at Merkel & Cocke will look into the circumstances surrounding your accident and find out who or what was responsible. We work to get you compensation for your injuries. Our lawyers have offices in Jackson and Clarksdale. You are welcome to call us today at 662-799-1633 or complete our contact form to schedule a free consultation.